Christmas is fast approaching, and I’m so happy to have my decorating DONE. 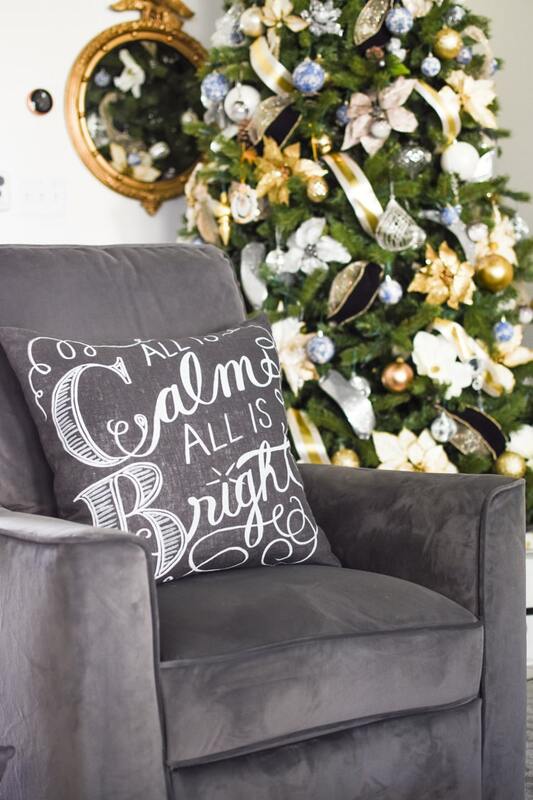 This post is full of simple and elegant Christmas living room decor ideas that I hope leave you inspired! My friend Marty from A Stroll Thru Life is always so kind and includes me in these tours, and I appreciate having such a dear, longtime blogging friend. A warm hello to those of you visiting from 11 Magnolia Lane. I simply adore their style! 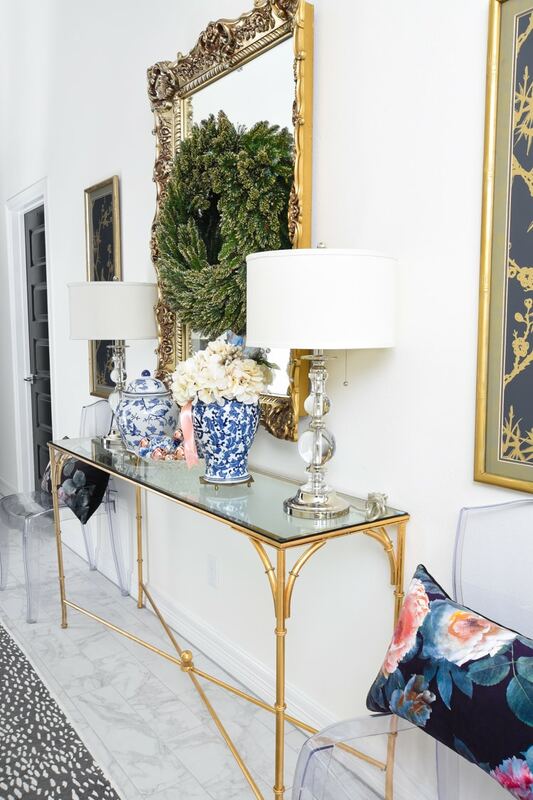 My foyer recently got a little bit of an upgrade with a new mirror we found at a consignment store. 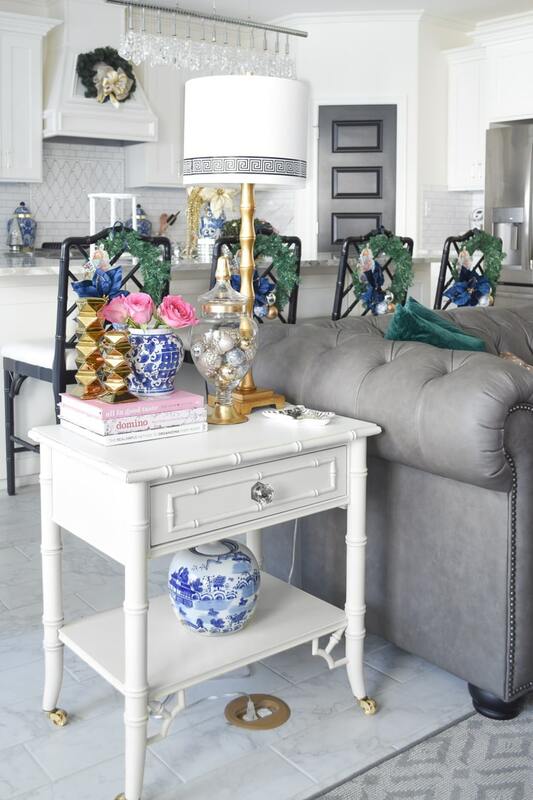 The mirror is such a statement piece! 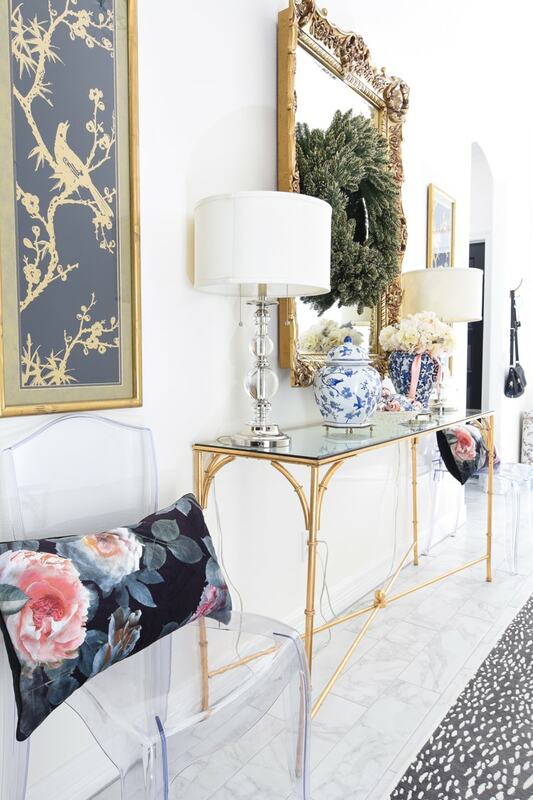 The rug runner is a recent new addition that I love, and I chose to place my ghost chairs flanking the console table to add a bit of interest. 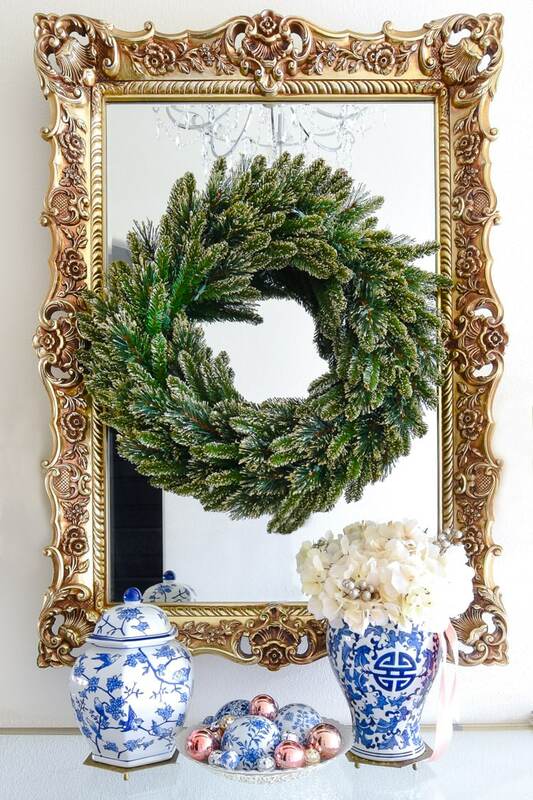 A big glittered wreath hovers over some ginger jars and a bowl of carpet balls and holiday ornaments. Simple, elegant and no fuss. 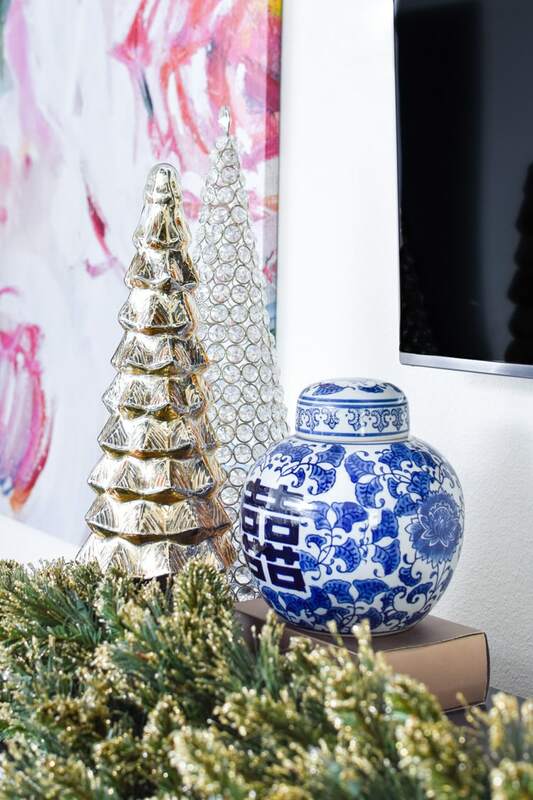 In my living room, the main star of the show is my chinoiserie Christmas tree adorned with DIY blue and white ornaments. I love how opulent and classic my Christmas tree looks paired with my more casual and modern furnishings. Sitting in these new gray recliners and basking in the Christmas living room decor has become my favorite way to spend my weekends. I’ve watched Elf at least five times. 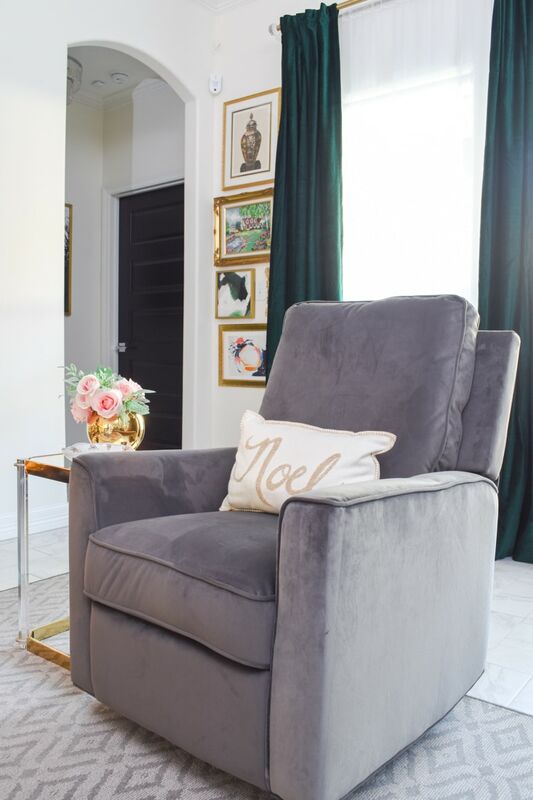 The emerald green velvet curtains were a recent purchase, and I love the impact they make in the room. Green truly looks good with anything! I HAVE A FIREPLACE! 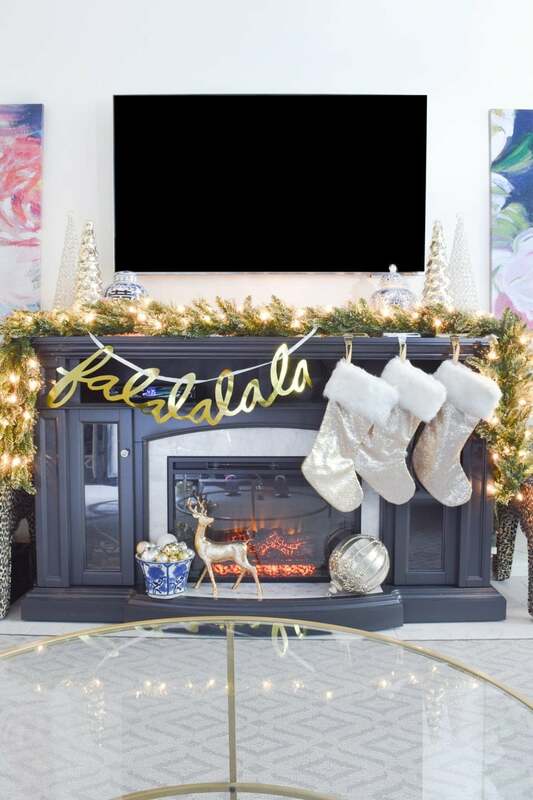 We lucked out in finding this fireplace for under $150 at Lowes this fall, and I couldn’t wait to decorate it for Christmas. 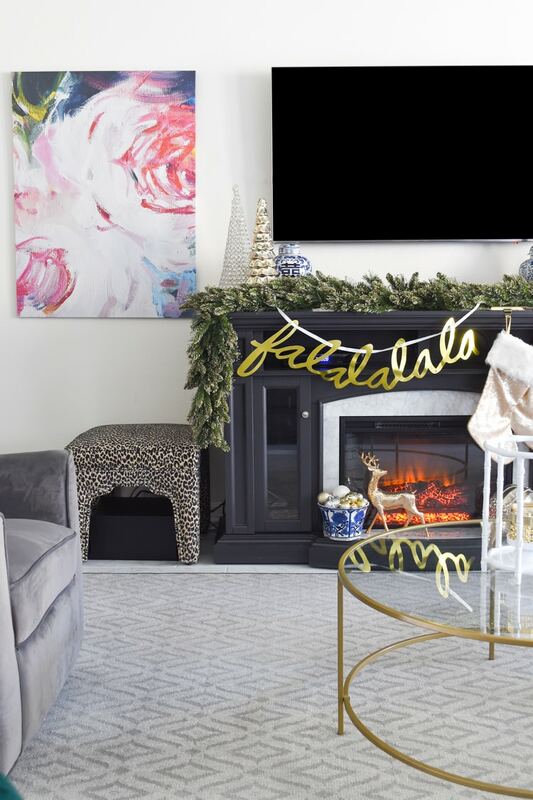 I think a fireplace mantel is one of the best places to incorporate Christmas living room decor, but I chose to keep it kind of simple. A ginger jar and two Christmas trees flank each side of the fireplace mantel. I love how my new art canvases look- those are printables I bought on Etsy and had enlarged into 30×40 inch canvases at Nations Photo Lab. 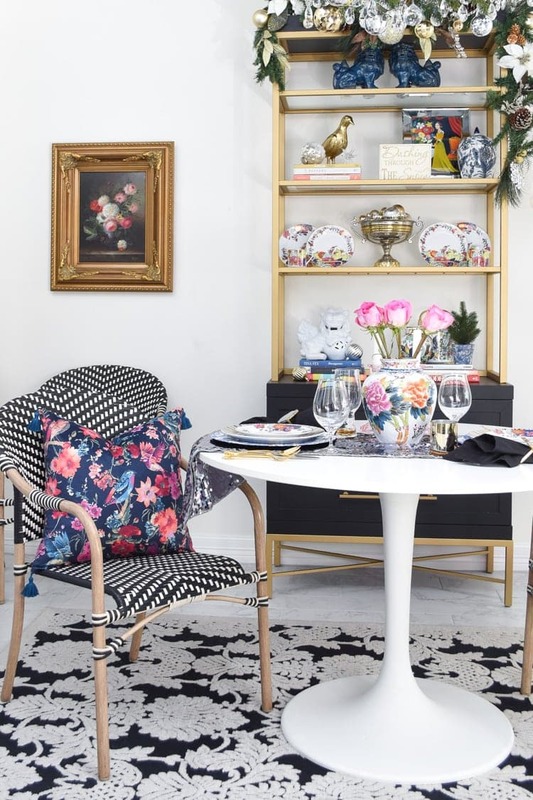 The left floral art print has a peony/rose vibe while the florals on the right have a more bouquet/abstract vibe. And my fave matte gold sequin stockings add a punch of girly glam. 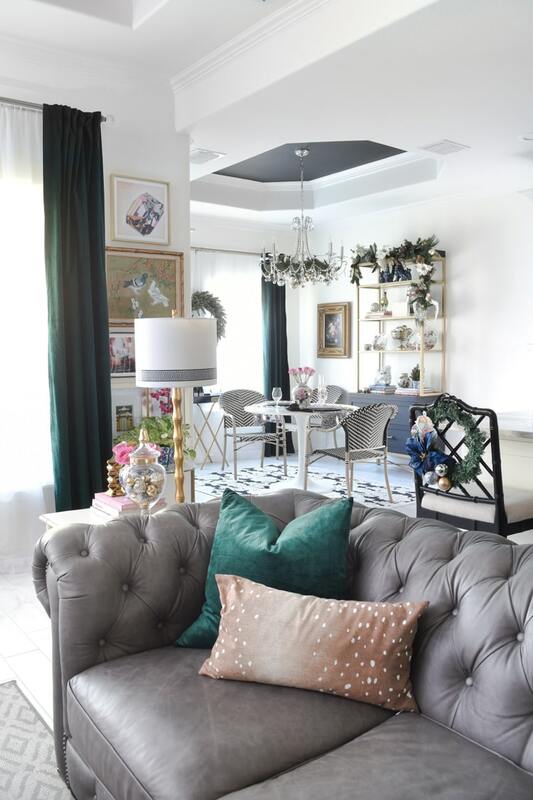 The leopard ottomans provide extra seating in a pinch during family gatherings, and overall this living room space is cozy and inviting. That black box hiding under the ottoman is the bass for our sound system. 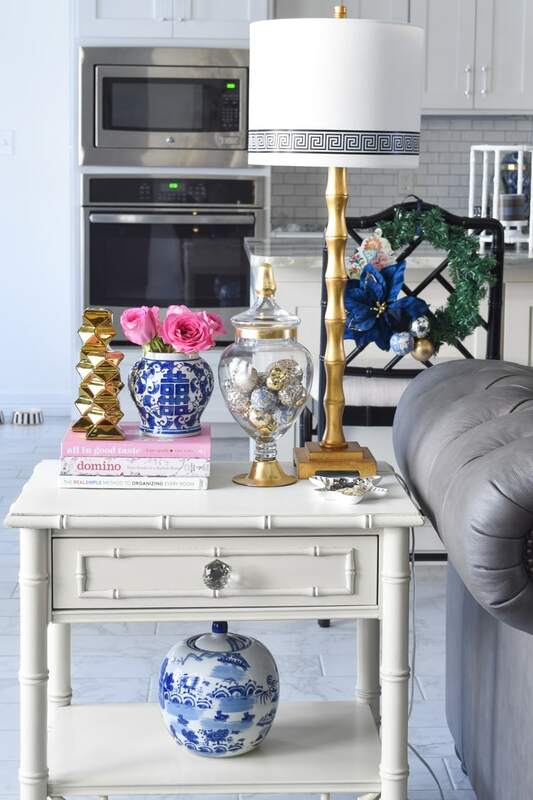 I also incorporated some simple decor on our end tables since to tie in the various colors and patterns used in the adjacent kitchen and dining room. These bamboo end tables were a heck of a find at a local thrift store. I added some casters to add height to the end tables. 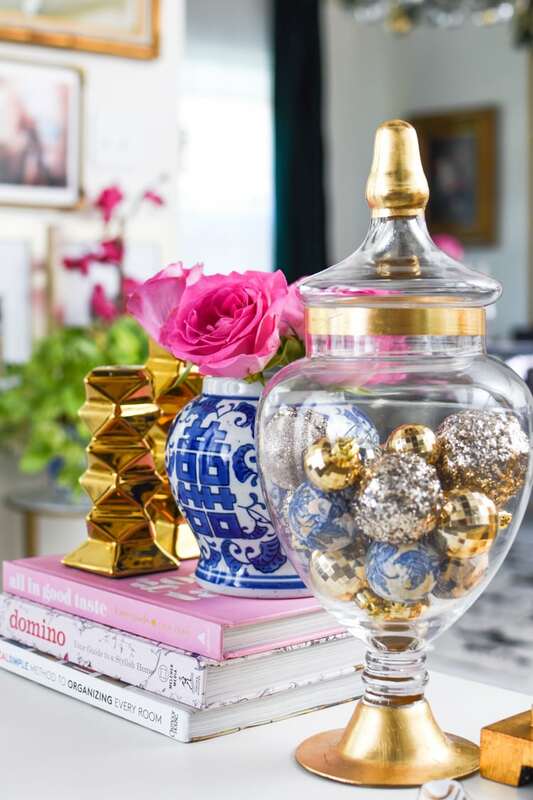 I never put away unused ornaments- I simply toss them into vases or apothecary jars to add glamour to vignettes. My living room holiday decor this year really makes me happy and I pretty much used what I had on hand. 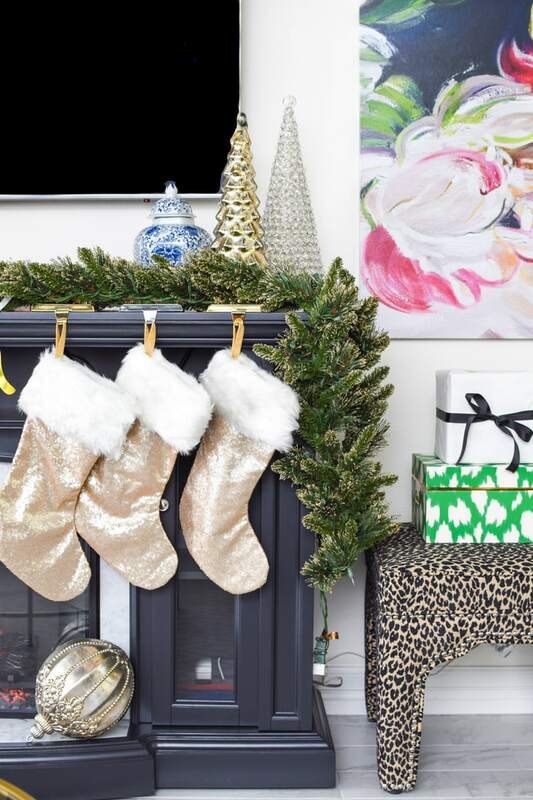 Truthfully, I keep my Christmas decor stored away by color, so if I want to change it up, it’s as simple as maybe buying an additional color or two. Overall, I use the same main pieces each year. BUT…My absolute favorite holiday space of mine this year though has to be my colorful Christmas home office! 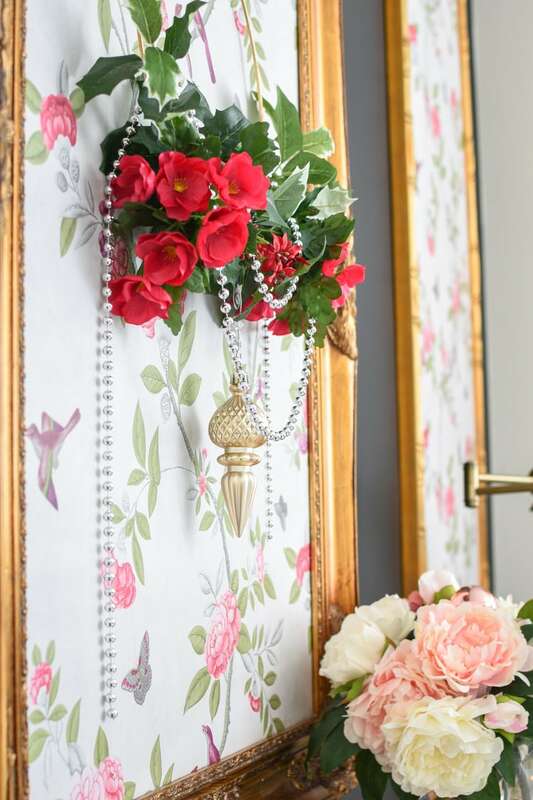 Here’s another sneak peek, but if you want to see more, go take my floral home office holiday tour! 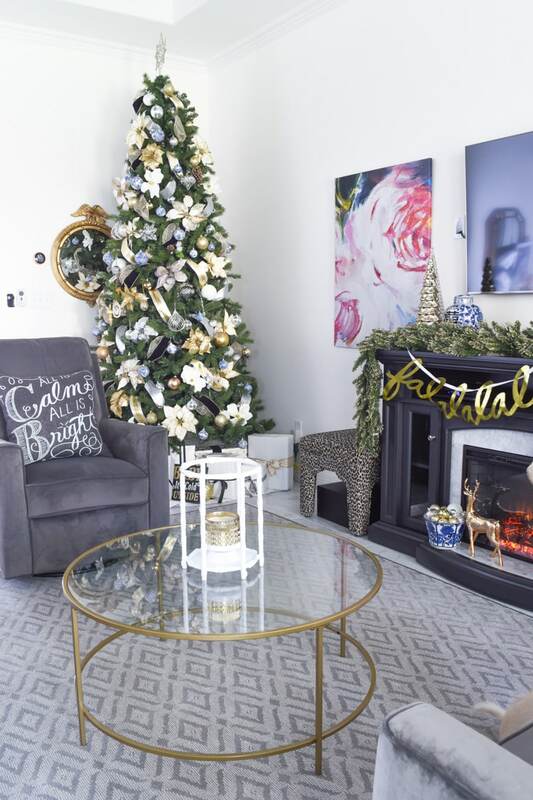 Thank you so much for stopping by to see my Christmas living room decor (and foyer!) 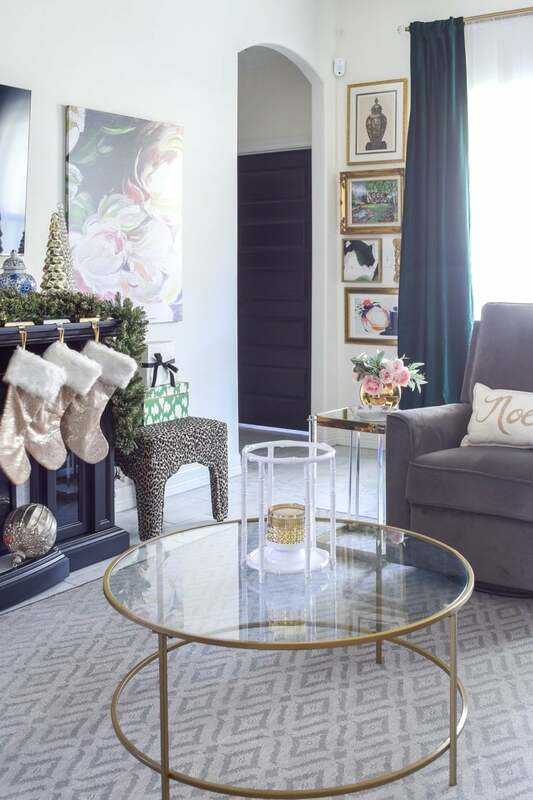 I hope you’ll click the links within this post to go tour the various other rooms in my home all decked out for the holiday season. 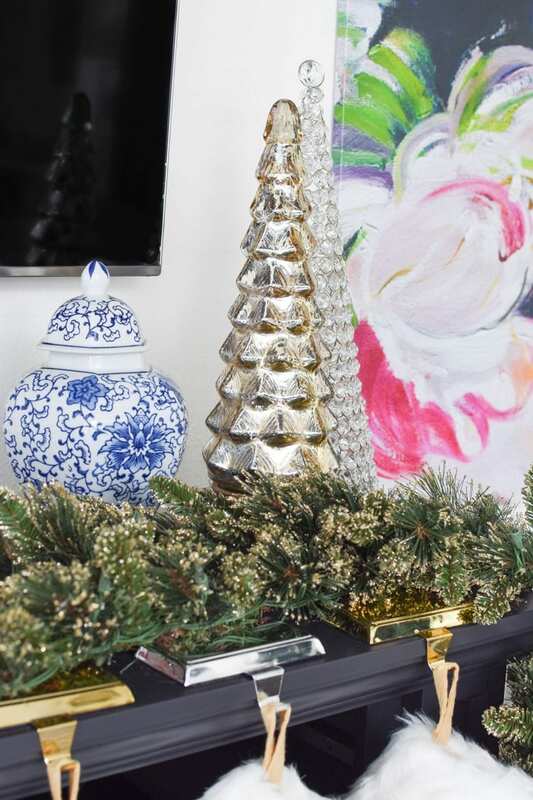 And don’t forget to stop by Jenna’s blog, Rain on a Tin Roof for more colorful and fun holiday decor. She is so sweet and I adore her home! Love the blue! 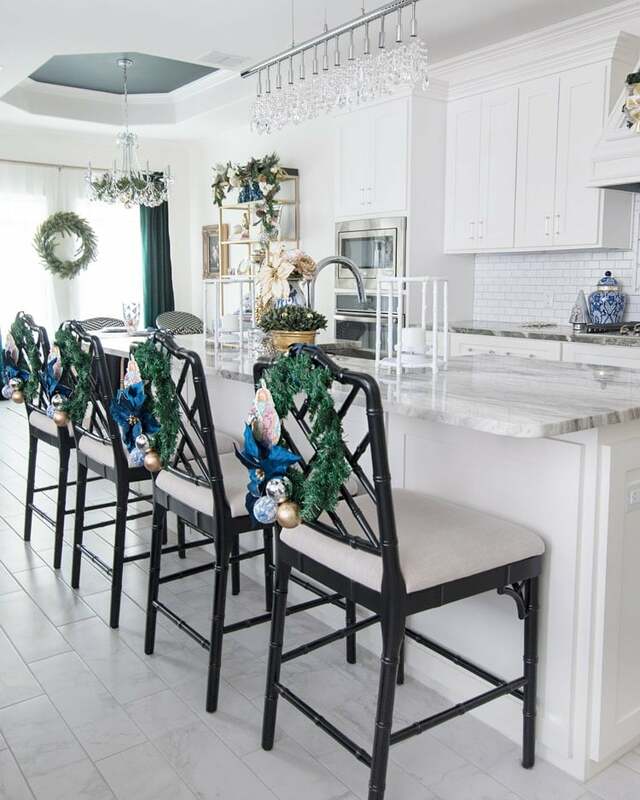 Your kitchen and tree especially look gorgeous! So gorgeous! 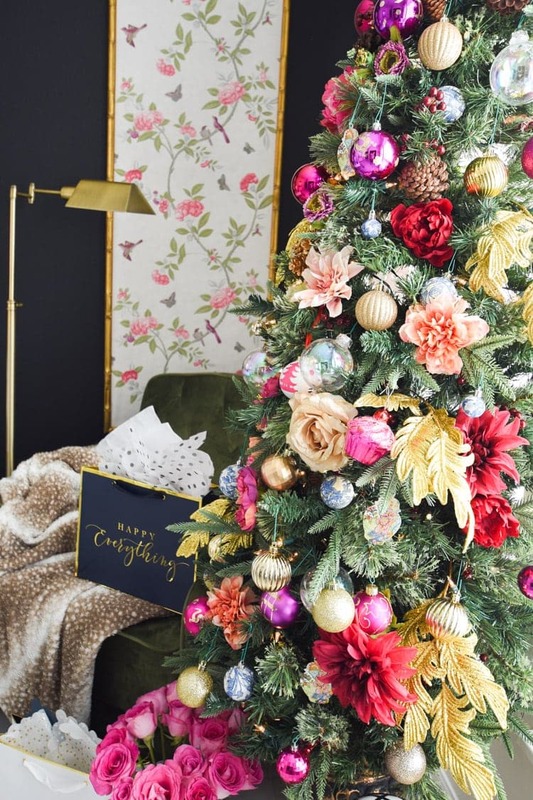 Love your office tree and the chinoiserie Christmas tree. The wreaths one the stools are such a pretty touch too. You outdid yourself. Love your new mirror! The mantel is truly gorgeous. So happy to be on the tour with you! LOVE IT ALL. 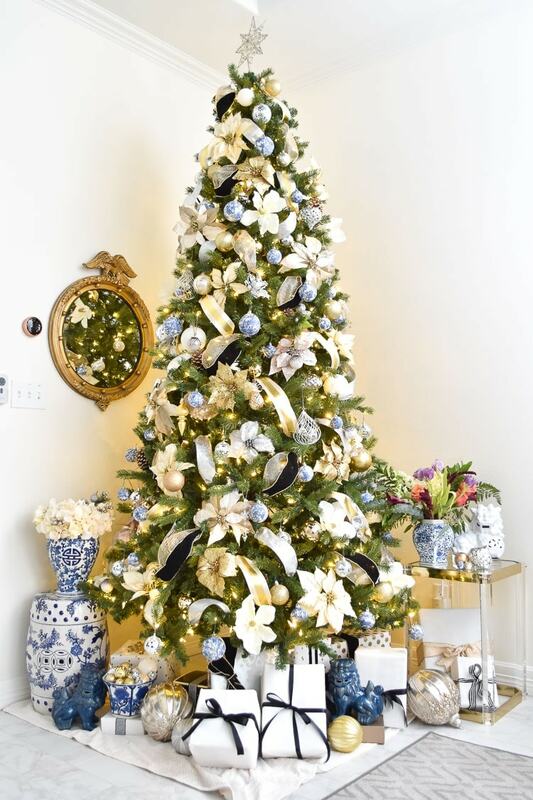 I love your glamorous tree and your beautiful living room. 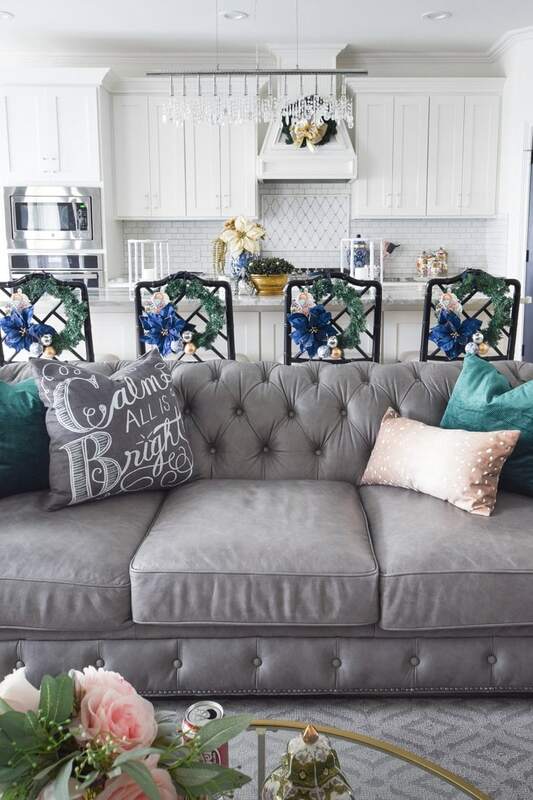 You have created such a beautiful home and your Christmas decor is stunning. I always love seeing what you do and I am always inspired. Thanks so much for joining the tours, your home is so pretty.